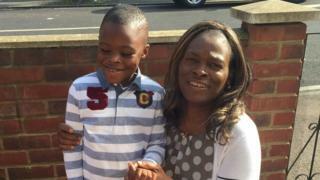 Joel Urhie's body was found in the bedroom he shared with his mother Efe Urhie at the house in Adolphus Street, Deptford, on 7 August. His mother and sister jumped to safety from the first floor. Officers said they had spoken to the man, who is not a suspect, seen on CCTV an hour before the arson attack. The CCTV images were shown on BBC One's Crimewatch Roadshow on Friday. The man was seen on camera cycling with a petrol can, which he appeared to fill with fuel at a Shell garage in Shooters Hill Road and then cycled away. He has now been ruled out of the investigation, police said. In August two men, aged 21 and 29, were arrested in south London on suspicion of murder, attempted murder and arson with intent to endanger life. They have been released while inquiries continue. The Met said nobody had been charged in connection with Joel's death.